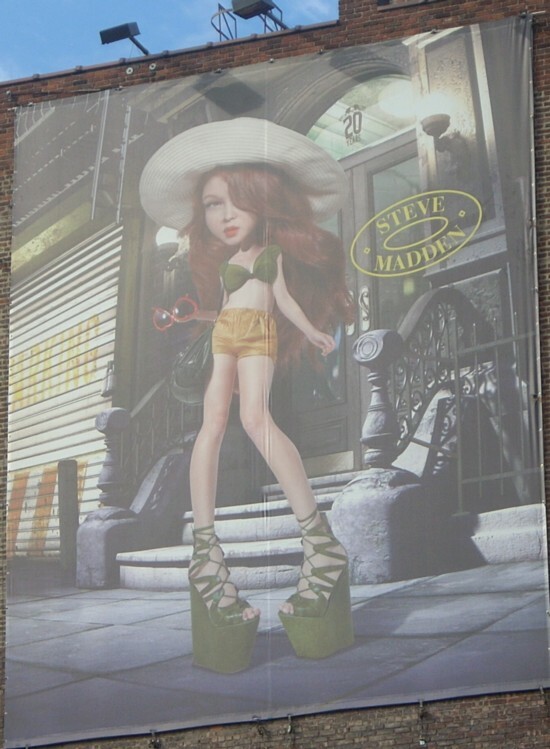 This Steve Madden billboard is installed on Little West 12th Street, off of 9th Avenue. Back in 1967, the Jefferson Airplane’s Grace Slick sang of pills that make you larger. How very long ago that was becomes obvious by glancing at this Steve Madden billboard. The contemporary Alice of the city streets isn’t interested in expanding consciousness. What she wants to grow are her breasts, her head, and her feet — with the focus on the feet. This Steve Madden Big Head Girl ad is using a different concept than the ones from the ’90s. Those images portrayed adult women with the Big Head feature expressing interaction. When speaking with someone — or even just gazing at a person with the hope of conversation — one looks at the face. Then, the head nearly fills your field of vision with the rest of the body foreshortened. The new graphic is a surreal representation of a child. The billboard shows a pre-adolescent girl trying on her mother’s hat and shoes. Magically, though there’s nothing in the picture to lead us to think that her brain is brimming with ideas, the auburn haired head has blown up like a balloon to fill the hat. Similarly, the feet — erect and stiff with straps — have swollen to fill the shoes. With the ramped-up footwear the little lady of 2011 is a big girl now. It’s sad to think that any adult woman is haunted by her body image as a twelve-year-old, like a physical version of the Flowers for Algernon artificial genius Charlie tortured by the presence of himself as a challenged child. And isn’t this the great horrible doubt that torments the American Faith’s belief in the After? That all those Befores alone by the telephone in the nation’s night will send in their coupons only never to be Charles Atlas or even the Life of the Party. As the New York City Meatpacking District’s streets are paved with rough cobble stones, there’s no better place to view the injury that women inflict on themselves by wearing high-heeled pedal monstrosities. Barely able to keep from falling while trying to cross the uneven streets, women so ball and chained often need to be physically supported by their male companions. The contrast between the marketing’s illusory promise of somehow morphing into a strong woman — miraculously becoming like William Gibson’s female enforcer Sally Shears, who wore heavy boots for a “job” in Mona Lisa Overdrive — and the insulting reality of fashionable foot binding disguised as self-improvement is stark. This is similar to cigarette advertising’s Marlboro Man false offer of rugged individualism when tobacco’s truth is dependency and infirmity, a complete reversal of fact, a Big Lie. For some time, the lights over this sign did not turn on at night, and so the ad was only visible during the day. As the winter daylight hours are short and the area’s night life is active, the lack of nocturnal visibility was not easy to understand. Did the advertiser forget to pay the electric bill? Did a squirrel chew through the wire? Was it just a long time before anyone ever checked to see if the lights were working? This evening (01/07/11), just one light out of 3 is providing illumination.